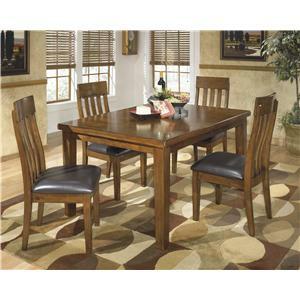 The Carolyn Five Piece Glass Top Table and Side Chairs Dining Set features modern style in a unique combination of glass, metal, and slate. 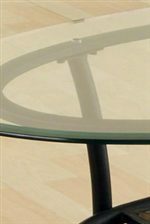 A round tabletop shaped from 8mm tempered glass creates an elegant display window to the decorative pedestal base below. Black metal shapes into a slender frame to create the basic profile of the Carolyn Side Chair. 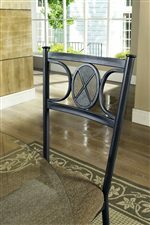 Four column legs sit on decorative foot rings. 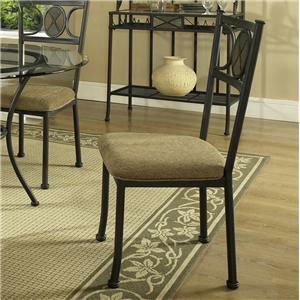 A slightly bent and bowed seat back are decorated in sleek black metal shapes with colorful slate inlays. 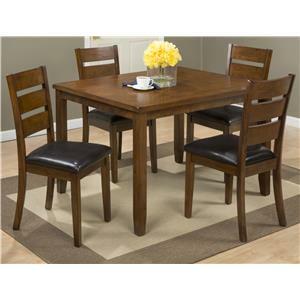 A plush cushion rests on the chair seat for a comfortable dining experience. 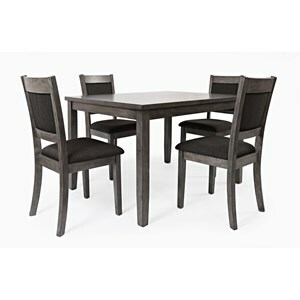 The juxtaposition of metal, fabric, and slate give the Carolyn Five Piece Glass Top Table and Side Chair Dining Set a modern chic appeal for the dining room. 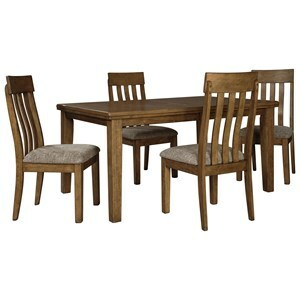 The Carolyn 5-Piece Casual Round Dining Table & Side Chair Set by Steve Silver at VanDrie Home Furnishings in the Cadillac, Traverse City, Big Rapids, Houghton Lake and Northern Michigan area. Product availability may vary. Contact us for the most current availability on this product. Case Construction Black metal frames, select pieces feature glass and slate. 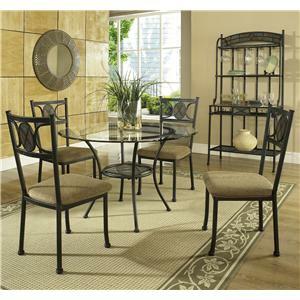 An inventive juxtaposition of glass, slate, fabric, and black metal makes the Carolyn Collection a beautifully casual set. Bold metal frames are softened with natural tones of fabric and slate. 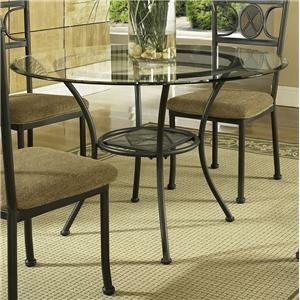 Glass tabletops offer a classy appeal and act as showcases for the artfully innovative frames below. Shelves and racks make this collection functional as well as stylish, offering storage and display space for all your belongings. Intricate details like tubed feet and slate inlay creates an artsy undertone throughout the collection that adds depth to each piece of furniture. 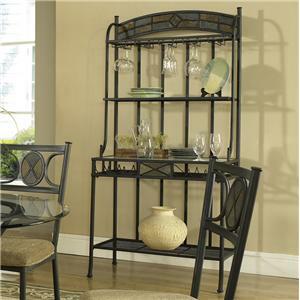 For the most interesting casual chic look, fill your home with the artsy Carolyn Collection furniture. 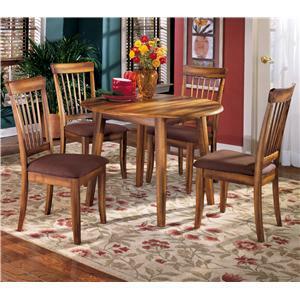 The Carolyn collection is a great option if you are looking for Casual furniture in the Cadillac, Traverse City, Big Rapids, Houghton Lake and Northern Michigan area. 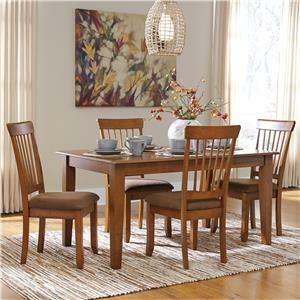 Browse other items in the Carolyn collection from VanDrie Home Furnishings in the Cadillac, Traverse City, Big Rapids, Houghton Lake and Northern Michigan area.